Home » Outstanding Response to Name the New Genesis Assistance Dog Puppy! 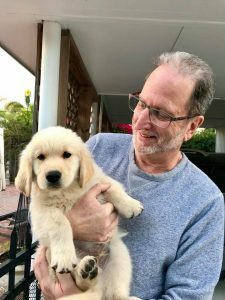 The Board of Directors at Genesis Assistance Dogs, Inc. is so very grateful to all those who have submitted potential names for our new Genesis Assistance Dog Puppy! We have received a whopping 107 suggestions and are amazed at the creativity of our supporters. This little bundle arrived early this morning in West Palm Beach. He was lovingly welcomed by Charlie and Jeff Eagle. His training has begun, and well, we realized immediately that he is so very bright we can’t just keep calling him “Puppy.” We have closed the form that permits you to submit a name for consideration so that we can vote to select his new moniker. We still won’t publicly announce his name until the evening of the Networking to Help Children Event on March 27th. So, if you have already made a submission for a name, you are still in the running for winning the gift basket and a picture with this handsome puppy. We apologize to anyone who had not made a submission yet. It’s so very important that this energetic little boy gets his name right away. This will help those who are working with him tremendously. Don’t worry, there will be future puppies needing names and we will always keep you updated and involved! Thank you for your continued support of Genesis Assistance Dogs, Inc. Hope to see you on the 27th!